Give a monkey an infinite amount of time at a keyboard and he'll eventually come with the complete works of Shakespeare, say the theorem. 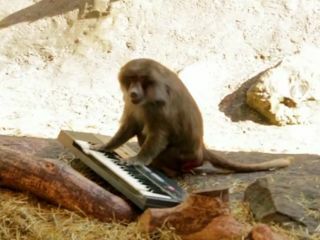 But what happens when you give six species of them some synthesizers to play? That was the question asked by Swedish musician Håkan Libdo, and the answer is revealed in the video above. Maybe Alan Partridge could make a TV show out of it.